Applico empowers the community of industry leaders at large, traditional enterprises to fight back against big tech monopolies and win. By working alongside C-suites and Boards as operating partners, Applico helps incumbents build or buy their own platform business to beat big tech at its own game. As the world’s first Platform Innovation® company, we provide advisory services to build, execute and scale platform businesses to strengthen traditional companies’ core business. We work with C-suites at Fortune 100 firms as well as multibillion-dollar private companies who want to take the initiative to create a platform business. Our staff is comprised of platform entrepreneurs, operators, bankers and designers. Founded in 2009 by Alex Moazed, Applico has worked with large enterprises for more than 8 years. 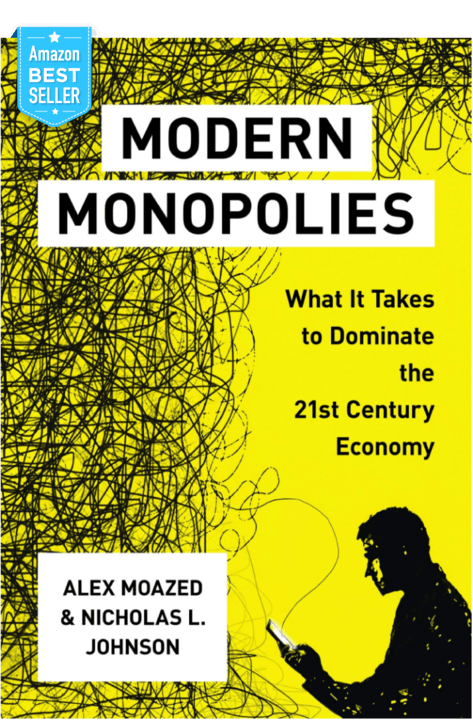 With the release of Modern Monopolies in 2016, Alex Moazed and Nicholas Johnson coined a new industry focused on platform businesses. In the past few years, Applico’s Platform Innovation® work has created hundreds of millions of dollars in enterprise platform value. Modern Monopolies explains the infrastructure and techniques required to build a modern and successful tech platform business like Uber and Airbnb. The book was recently recognized as an Amazon Best-Seller and has been featured on Yahoo and Bloomberg. "These knuckleheads think monopolies are a good thing"
"Modern Monopolies brilliantly lays out the formula for how to get rich in the platform economy. This book will become the handbook for the next generation of business leaders." "A required read for anyone interested in building, or investing in, network-based businesses." "Modern Monopolies brilliantly reveals the secrets of the start-ups that are scaling platform businesses. A must read for any serious entrepreneur or investor."